Sunday Mass is crowded. Slowly, beginning in the front pews, people stand and head toward the altar. You know the moment. Everyone is lining up to receive holy Communion. As an extraordinary minister of holy Communion, I have observed this moment from a unique vantage point. I see the line snaking forward and have the duty — and honor — in this very physical faith we have, of handing the host, now Christ’s body, or the cup containing his blood, into the hands of my fellow Catholics. People who perform this duty do not forget what a truly grace-filled moment this is. I guess you might call it “extraordinary.” I chuckle about this title, because at first glance “extraordinary minister of holy Communion” suggests maybe I should don my superhero cape for Mass. The title sounds pretty special, doesn’t it? But alas, I can leave my cape at home. What the title means is that the laypeople who distribute holy Communion are doing so only under extraordinary circumstances. The “ordinary” ministers are ordained — priests or deacons — and they are the ones who are the first ministers for the distribution of the sacrament, unless something important intervenes. A priest friend of mine was recovering from shoulder surgery and the repetitive motion of presenting the Eucharist would have been injurious. Even so, he stood at the center of the altar to indicate his special status in this ritual. Despite the primary role of the ordained, the church realized that it detracts from the flow of the Mass if the reception of Communion takes an inordinate amount of time. So, after the Second Vatican Council, laypeople were given the privilege of distributing the Eucharist when needed. I’m delighted that lay ministers have become an expected and accepted part of Mass. For me, this role conveys the concept of the priesthood of the faithful. It extends the participation of the laity in the rituals of our faith. I find it humbling and sometimes even emotionally charged to share the Eucharist. Although no one can read another’s thoughts, it’s touching to sense how some people come forward with an intensity that speaks to their prayerfulness in the moment. There are those who seem to receive as if welcoming a lover, or others who smile with the knowledge they are encountering a friend who will spend time with them. Of course, there are always those who seem bored, as if this is just a routine. There are those whose bow before the Eucharist seems very genuine; there’s the occasional person who insists on genuflecting as you pray silently that they won’t trip the person behind them. But mostly, I realize that as I present the Eucharist, I have no idea what pains or joys this person brings to the altar. I am touched that even though I cannot read their hearts, the One who is coming to them knows them deeply. When I distribute Communion, I like to look the person in the eye and smile slightly as I lift the Eucharist for them to see. I do not want my actions to seem routine or bored or pietistic. This is not mechanical, this is person to person, the body of Christ — all of us — sharing the body of Christ. This is the fundamental truth of this sacrament and nothing should detract from it. 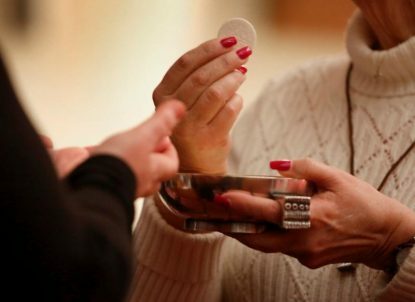 “I DO NOT say their name” – it is NOT permitted to do so when distributing Eucharist.